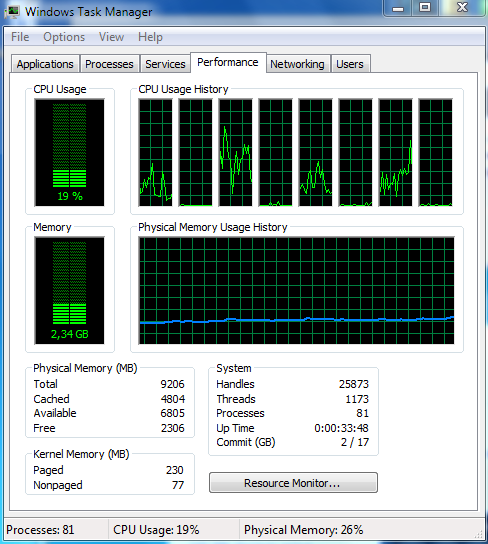 When I go to the task manager I see 8 processors but I know that I have 4. Why? Hyper-threading abstracts away task switching from the operating systems. Normally an operating system has to deal with scheduling processes over different CPUs as well as ensuring that each task that runs on the system has its fair share, but not too much (if something else wants it) of the CPU. Hyper-threading is a way of taking that 2nd process of task sharing away from the operating system, at least for a little bit. The reason is that the processor can task switch much faster than the operating system can tell it to. So by presenting two logical processors when there is in fact only one, the operating system has to do only half as many task switching operations, but more CPU scheduling. But the net result is supposedly a faster machine in multi-tasking operations. The actual benefits of this vary greatly depending on the workload that you're doing. For most people, there is no harm in leaving it on or turning it off. 4 vs 8 threads is like choosing between a ferrari or a lamborghini for home users. However, in server scenarios, it can make a large difference. For example, hypervisors can often get a large increase in speed through the use of hyperthreading, as they have very strict CPU scheduling requirements. However, SQL servers often do not get this increase, because it's often better to have four "large" threads than 8 "medium" sized threads. That my friend is hyper-threading. Hyperthreading is a form of simultaneous multi-threading that takes advantage of super scalar architecture. Multiple instructions operating on separate data in parallel. They appear to the OS as two processors, thus the OS can schedule two processes at once. In addition two or more processes can use the same resources. If one process fails then the resources can be readily re-allocated. The OS must support simultaneous multi-threading (SMT). The i7 family is a Quad-core processor that has 8 threads. Normal quad-cores have 4 threads, and since hyper-threading is enabled, your computer recognizes those 8 threads as processors. Not the answer you're looking for? Browse other questions tagged cpu multi-core or ask your own question. Number of kernel threads = cores? The CPU visible in Resource Manager are physical cores or logical processors? How many cores does an Xeon e5530 have? How to enable multiple processors on XP SP 3? How do the cores in an AMD Bulldozer module compare to Intel HTT virtual cores and two separate cores, in terms of multitasking performance? Windows Task Manager not showing all cores? Why does everything I do seem to use all my CPU cores? Why does Intel no longer disclose the P-States of its processors?